In 2017, we searched for 56 of the original 66 Echinacea hybrid plants. We found 28 Echinacea hybrids, and 2 of the Echinacea hybrids we found just had dead leaves from this year. This means that 42% of the original cohort is still alive, with the survival rate this winter of 78%. Of the surviving plants, the highest leaf count was 5 leaves, the longest basal leaf was 35cm, and only one plant had more than one basal rosette. Most plants we measured in exPt6 looked like this. This plot was originally developed for Josh Drizin’s experiment with exotic grasses, but 66 hybrids of Echinacea angustifolia and Echinacea pallida were also planted in 2012. 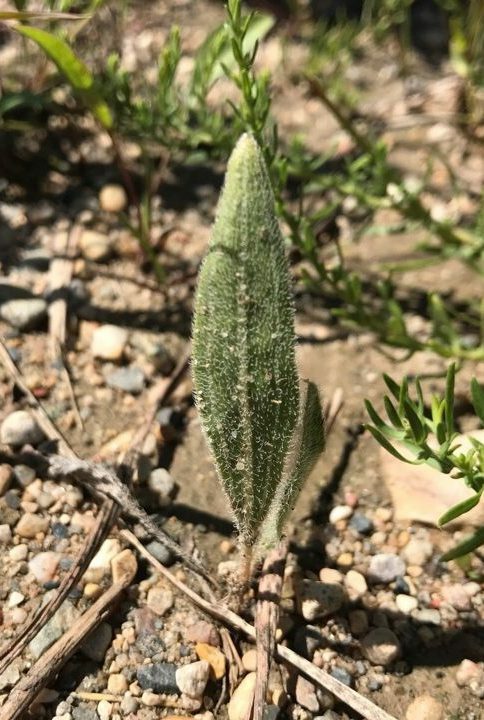 In 2011, Gretel and Nicholas Goldsmith performed reciprocal crosses between 5 non-native pallida plants found at Hegg Lake and 31 angustifolia plants in P1. These plants have been revisited each summer since then. Data collected: Status, rosette count, longest leaf measurement, and number of leaves for each plant. Exported to CGData. Products: Nicholas Goldsmith wrote a summary of the crosses he conducted in 2011. You can find more information about experimental plot 6 and previous flog posts about it on the background page for the experiment. Although originally used as part of Josh Drizin’s experiment with exotic grasses, this plot also has hybrids of Echinacea angustifolia and Echinacea pallida. Gretel and Nicholas Goldsmith performed reciprocal crosses between 5 non-native pallida plants found at Hegg Lake and 31 angustifolia plants in P1 and planted 66 seedlings between grasses in 2012. These plants have been revisited each summer since then. This year, on August 3rd, Laura Leventhal and I found 36 of the original 66 plants – a sharp decline from the 55 found last year. This means that 55% of the original cohort is still alive, with the survival rate this winter of 65%. Of the surviving plants, only three had more than one rosette. Products: Nicholas Goldsmith’s summary of the crossing done in 2011 can be found here. In 2015, we continued an experiment investigating fitness of Echinacea angustifolia x E. pallida hybrids. This year, out the the original 66 plants, 55 were still alive. That’s an impressive survival rate of 83% since they were planted in 2012. The mean leaf length of the plants was roughly 16 cm. 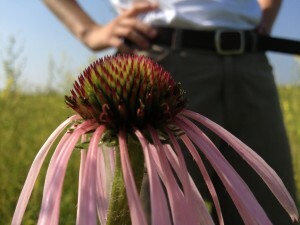 In the summer of 2011, Nicholas Goldsmith and Gretel Kiefer performed reciprocal crosses between 5 plants of Echinacea pallida (non-native) found in a prairie restoration at the Hegg Lake Wildlife Management Area and 31 plants of the native Echinacea angustifolia from experimental plot 1 to determine the hybridization potential of these two species. In the summer of 2012, team members planted 66 seedlings. Read more flog posts about this experiment here. 1. Katherine Muller and Lydia English’s aphid addition/exclusion experiment in P1. 2. Assessing fitness of the two Echinacea species and their hybrids in P6 (Josh’s Garden) and P7 (at Hegg Lake). 3. Recording flowering phenology of Echinacea pallida at Hegg Lake, where they were planted in a prairie restoration. Last Thursday we planted seedlings from Nicholas Goldsmith’s cross pollination experiment in Josh’s Garden. Here are the data sheets with planting information. What’s this in plug 156? 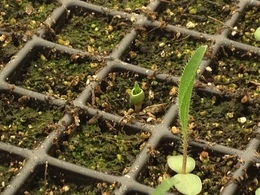 A young seedling with fused cotyledons and a true leaf just peeping up. in the nearby corner is a more typical seedling. Both plants come from florets of Echinacea angustifolia that were pollinated with pollen from Echinacea pallida. Today is my last day with in Douglas County, MN for the summer. I have been trying to get everything together before I go, and so this post will include some files that do a bit of wrapping up from my independent project. I have been working some on my R analysis, and hope to get some statistics time in to help me better analyze my data. Here is what I have so far. I have reorganized my script since the last version to have a more question-based flow, and have changed some of the tests I perform. I have started work on analysis of my style shriveling data from the crosses between Echinacea pallida and Echinacea angustifolia. Attached is the R code I have so far.